Thanks to my membership in D23 I was able to attend a free preview screening of MILLION DOLLAR ARM (2014) tonight. What a treat! This excellent sports film, starring Jon Hamm and a terrific cast, opens on May 16th. 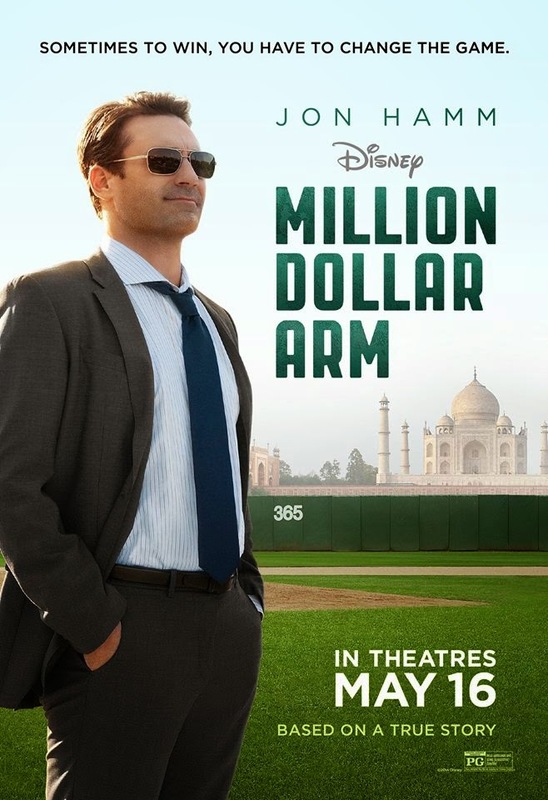 MILLION DOLLAR ARM joins an impressive list of successful Disney sports pictures of recent years, which includes THE ROOKIE (2002), MIRACLE (2004), and INVINCIBLE (2006). It's also a great addition to a long line of special films revolving around baseball. Hamm plays Los Angeles sports agent J.B. Bernstein, who is watching the firm he founded with Ash Vasudevan (Aasif Mandvi) slowly circling the drain. Out of clients and money, J.B. hits on a unique idea, searching among cricket players in India for a potential Major League Baseball pitcher. He sells the idea of sponsoring a "Million Dollar Arm" contest to businessman Chang (Tzi Ma) and heads for India, along with a deceptively sleepy retired baseball scout (Alan Arkin). Months later J.B. returns to L.A. with two contest winners, Rinku (Suraj Sharma) and Dinesh (Madhur Mittal). The two young men begin to learn the sport of baseball under Coach House (Bill Paxton) at the University of Southern California, but there will be bumps along the way as they adjust to life in the U.S. and learning a challenging sport. That said, it may be J.B. who has the most learning to do. The filmmakers take the tried and true "feel good" sports film and turn it into something unique, starting with the exotic scenes depicting life in India. The movie is touching without being sappy, working in ample doses of humor. The viewer knows the film is certain to end on a high note, but it's a very interesting, uncliched, and often funny journey before arriving at that place. The scenes set in India are colorful, fascinating, and yes, a touch sad, as poverty is everywhere. For the two young men, the contest means a chance at a better life, not just for themselves but for their families. What J.B. doesn't know is that in taking responsibility for Rinku and Dinesh, he's going to have a better life as well. Hamm walks the line showing his character as, at times, a thoughtless jerk, while conveying enough of J.B.'s winning side to retain audience sympathy as he struggles to mature. While in India, J.B. slowly develops a relationship with his tenant Brenda (Lake Bell), thanks to chats on Skype. Brenda, a medical student who rents a cottage in his backyard, is admirably "together" -- other than her deplorable housekeeping -- and serves as a sounding board, friend, and eventually lover. I especially admired the way Brenda handled confrontation, refusing to fly off in a huff and be insulted, but instead calmly calling it like it is. In one of my favorite scenes, J.B. scans his laptop around so Brenda can see the view of India from his balcony at dusk. It was a very "real" moment for anyone who's chatted with family or friends in faraway places via Skype. 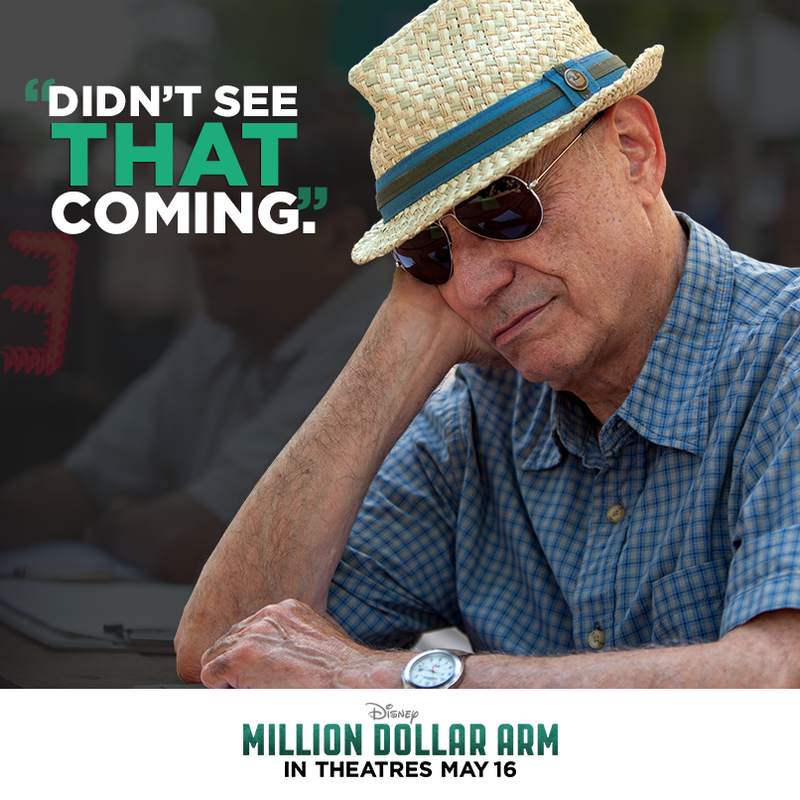 It had previously escaped my notice that Alan Arkin is in the film, and he just about steals the movie, with some of the funniest bits and a priceless scene near the end. I think another Supporting Actor nomination -- his last Oscar nod was for ARGO (2012) -- could be appropriate. I was delighted that much of the film was set on the campus of USC; in fact, Rinku and Dinesh wear Trojans gear for much of the film. I thought Bill Paxton (APOLLO 13) was another outstanding performance as the low-key, positive USC coach, who reads situations that J.B. initially misses. Like Brenda, Coach House briskly, professionally lets J.B. know when he's wrong, and it eventually sinks in. MILLION DOLLAR ARM was filmed by Gyula Pados and directed by Craig Gillespie. Gillespie is slated to direct Chris Pine in Disney's THE FINEST HOURS, about a Coast Guard rescue operation in the 1950s. Parental Advisory: This movie is a mild PG rating for some brief suggestive content and language. For the most part it's a family-friendly film. The trailer is at IMDb or the film's official website. For more on this film, Scout Foundas of Daily Variety has written an on-target review. 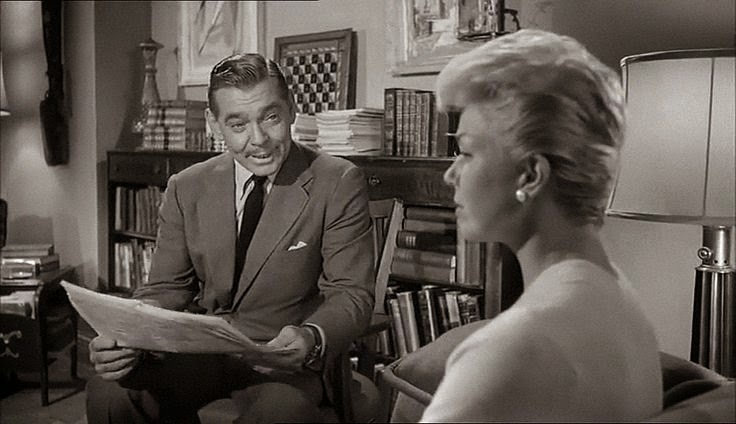 It had been so long since I last saw TEACHER'S PET (1958) that all I remembered from my previous viewing was newspaper editor Clark Gable showing up in college instructor Doris Day's classroom. I'd also forgotten just what a good movie it was, well-written and very well played. It provided a fine evening's entertainment. The storyline throws Day and Gable together to battle over the importance of experience vs. education when working in the newspaper business. 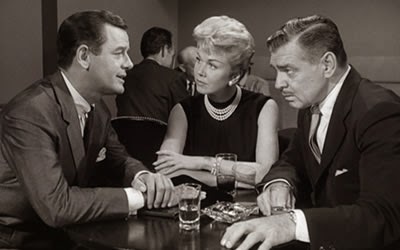 Dislike for the other's point of view wars with growing attraction...meanwhile there's a seemingly perfect professor (Oscar-nominated Gig Young) who may provide Gable with competition for the lovely Day. The Oscar-nominated screenplay by Fay and Michael Kanin is bright and witty, presenting characters who are realistically flawed yet sympathetic. While a couple of the "woman in the workplace" moments are dated, the movie remains surprisingly relevant, as newspapers are struggling to compete with the immediacy of television and radio. (Are longer "think pieces" an answer?) They couldn't know in 1958 that newspapers would continue to do well for a few more decades but that something called the Internet would prove to be an even bigger problem for print media than TV. Day could do comedy like nothing else, and the scene where she suddenly staggers with stunned shock a few seconds after having been kissed by Gable delighted me so much that I rewound it and watched it again! Perfectly played. I also loved her attempts at nonchalant poses after she notices Gable is in the nightclub when she's out on a date with Young. Gable, of course, was no slouch in the comedy department either. They're a great team. I've read some criticisms over the years that Gable was too old for Day -- my husband reminded me of hearing USC Professor Drew Casper, a huge Day fan, say that John Wayne would have been fantastic casting as the editor -- but Gable was the King and he works just fine for me. I liked that the screenplay took the "other man" storyline in an unconventional direction, having the good professor ultimately coaching Gable's character on how to win Day. There are some good moments between Gable and Young. It's nice that the Academy chose to reward a comedic performance with a Supporting Actor nomination. I was particularly delighted by the appearance of Charles Lane, playing one of Gable's righthand men, who sits with him at a table in the middle of the newsroom, making important-looking newspaper decisions. Lane didn't have a lot of lines but his very appearance throughout the film added tons of atmosphere. The cast also included Mamie Van Doren, Nick Adams, Marion Ross (HAPPY DAYS), Jack Albertson, and Peter Baldwin. 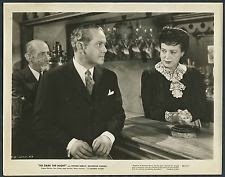 If there's a nightclub scene in a movie, there must be an appearance by Dress Extra Extraordinaire Bess Flowers, and indeed, there she is in the Bongo Club, at the next table over from Doris Day and Gig Young. Bess turns up next to the famous in so many party and nightclub movie scenes that I joked at Jacqueline's place the other day, "It's almost like she's a stalker!" 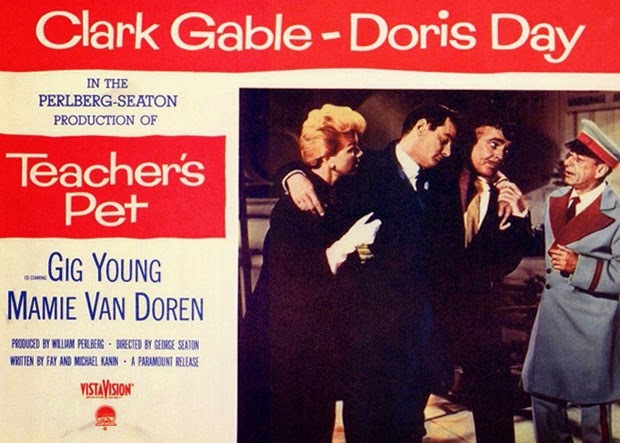 TEACHER'S PET was directed by George Seaton, whose credits included MIRACLE ON 34TH STREET (1947) and APARTMENT FOR PEGGY (1948). It was filmed in black and white by Haskell Boggs. The film runs 119 minutes. TEACHER'S PET is available on a widescreen DVD. It also had a VHS release. 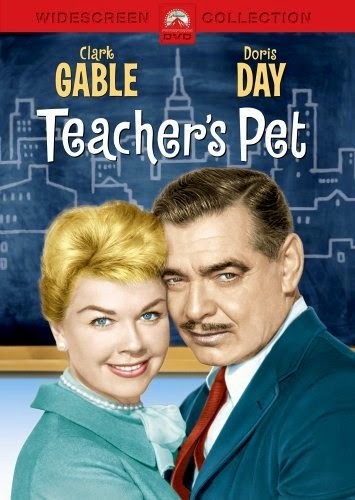 TEACHER'S PET can be streamed via Amazon Instant Video. Recommended as well-crafted, enjoyable entertainment. Day and Gable fans will love it. SO DARK THE NIGHT is a rather unique "B" movie about a French detective who goes on vacation, falls in love, and then must solve a series of murders. 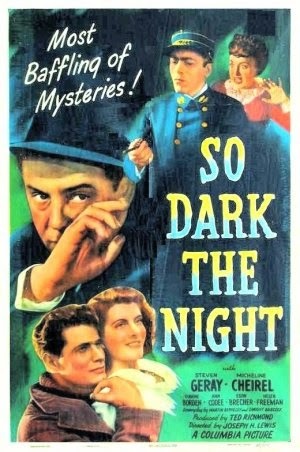 SO DARK THE NIGHT was shown last year at the Noir City Hollywood festival, and I was disappointed I was unable to see it. 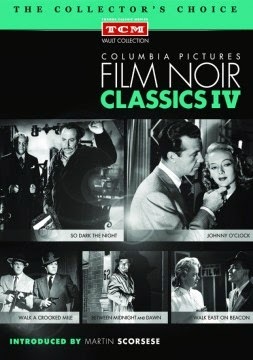 Fortunately it turned up a few months later in the Columbia Pictures Film Noir Classics, Vol. 4 collection from TCM, and I finally caught up with it this evening. The cast of lesser-known actors is led by Steven Geray, a busy working actor of the '40s. Geray usually played character roles, but here he has the lead as the fragile but talented Detective Henri Cassin. Cassin, a famous homicide detective, has been overworked, and his doctor insists he take a nice vacation in the French countryside. Cassin falls for the innkeeper's daughter Nanette (Micheline Cheirel of CORNERED), and despite their age difference she seems to love him too. Or does she love the idea of living in Paris and financial security? Nanette seems genuinely torn between Henri and Leon (Paul Marion), a farmer who was her childhood sweetheart. Nanette agrees to marry Henri, which infuriates Leon. And then suddenly both Nanette and Leon turn up dead. The devastated Henri sets out to solve the case. The movie has a remarkable visual style, filmed by Burnett Guffey, with France recreated on the studio lot as well as Canoga Park. I loved the use of windows and the tilted angles when the detective walks from one building to another in the local village. The score by Hugo Friedhofer is also quite good. SO DARK THE NIGHT is worth seeing in order to admire how creatively a low-budget film could be shot and scored. I wish I were as enthused about the rest of the movie. The cast is bland, and I had trouble becoming very involved in the story; I also saw the "surprise" ending coming from a mile away. The movie's look was memorable, but the cast was not. 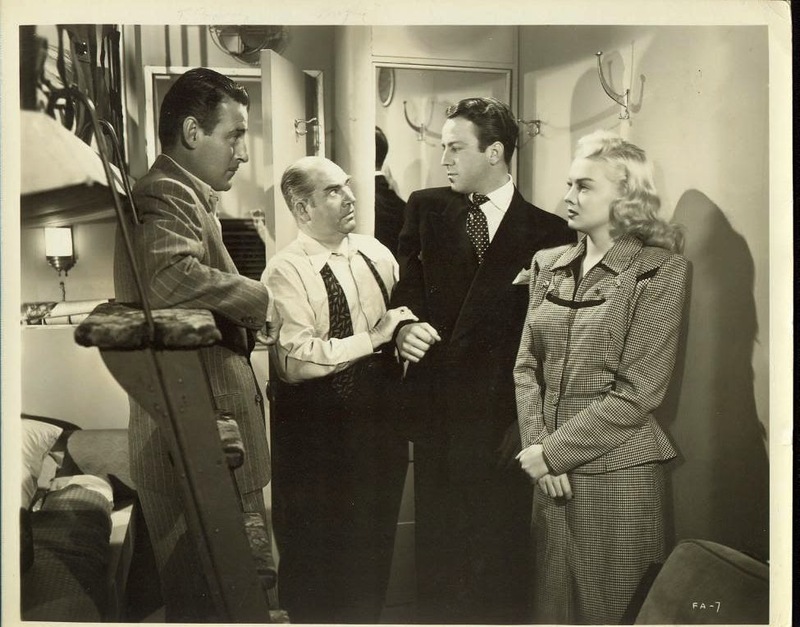 The film also stars Ann Codee, Eugene Borden, Egon Brecher, and Helen Freeman. This 71-minute film was directed by Joseph H. Lewis, director of MY NAME IS JULIA ROSS (1945) and GUN CRAZY (1950). There's more on the film at the TCM website. 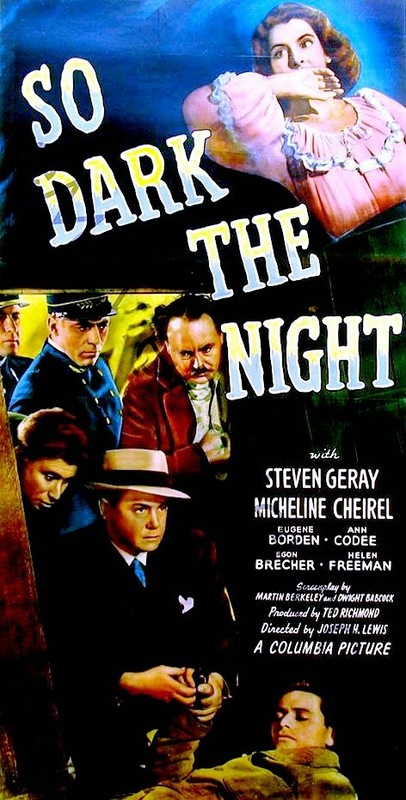 February 2019 Update: SO DARK THE NIGHT is being released this month on Blu-ray by Arrow Academy. Extras include a commentary track by Farran Smith Nehme and Glenn Kenny. ...is taking this weekend off due to our family's participation in the spring MouseAdventure game at Disneyland today. We walked a lot of miles and had a great time. For those who missed it, last weekend's big classic film link roundup is here, and a few days ago I also posted a gigantic roundup of news on Disney movies, books, theme parks, and more. Posts coming soon: The fifth and final day of the TCM Classic Film Festival, plus additional posts on individual screenings; an entry in Power-Mad, the upcoming blogathon celebrating the centennial of Tyrone Power's birth; book reviews; TCM in May; and more! Around the Blogosphere will return next weekend! This afternoon I had the privilege of attending a memorial tribute for producer-writer Stanley Rubin, who passed away last month at the age of 96. The program at the Egyptian Theatre, which I attended along with my friend Lindsay, was open to the public and free of charge. 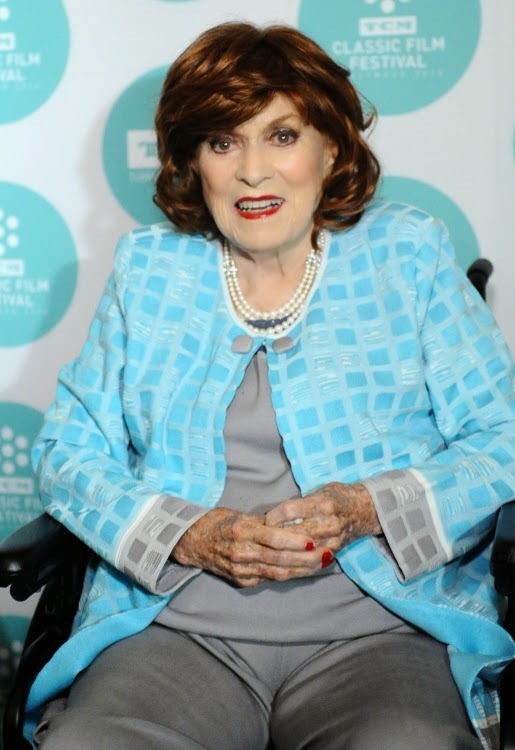 The afternoon was attended by Rubin's family, including his widow, actress Kathleen Hughes, and the family also graciously hosted a reception in the theatre lobby at the close of the tribute. Actress Marsha Hunt was also among the attendees. 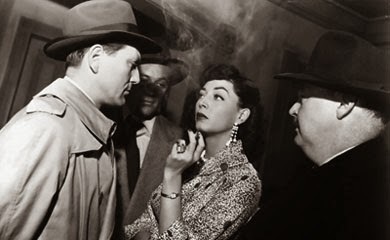 Alan K. Rode of the Film Noir Foundation served as host, and he reminisced that the very first movie shown at the first Noir City Hollywood festival was THE NARROW MARGIN (1952), with Rubin and Marie Windsor among those in attendance. The eulogists included Coleen Gray (seen above with Alan Rode), who wrote a letter to Rubin reflecting on his relationships and service to God, country, family, and community, and Susan Clark (seen below), who won a Best Actress Emmy starring in Rubin's production of BABE (1975). Clark teared up remembering that she met her late husband, Alex Karras, thanks to Stanley Rubin. Dennis Bartok, the first programmer of the American Cinematheque, read from a review of DESTINATION GOBI (1953) by Francois Truffaut and remembered the pleasure of seeing Rubin, director Robert Wise, and actor Don Taylor reminiscing and enjoying each other's company at a screening of the film. When Rubin was 88, he returned to UCLA to complete his Bachelor's degree, over 60 years after dropping out to go to work. When offered an honorary degree instead, he turned it down, saying he wanted to earn the real thing, and he did. It's such a wonderful and inspiring story that he set himself the goal of finishing the degree at an advanced age and accomplished it! Raquel posted his 2006 UCLA graduation photo in an obituary post at Out of the Past. Bob Rosen, the UCLA dean who assisted Rubin in completing the degree, remembered the irony of Rubin attending a class on television history -- when Rubin was the very first person to ever receive an Emmy Award! Rubin's writing credits included DECOY (1946), VIOLENCE (1947), and MACAO (1952). In addition to THE NARROW MARGIN (1952) and DESTINATION GOBI (1953) his film producing credits included RIVER OF NO RETURN (1954) with Robert Mitchum, DESTRY (1954) with Audie Murphy, and THE GIRL MOST LIKELY (1958), an old favorite of mine which starred Jane Powell. Rubin's TV credits included the '60s TV series THE GHOST AND MRS. MUIR and quality TV-movies such as BABE (1975), ...AND YOUR NAME IS JONAH (1979), and DON'T LOOK BACK: THE STORY OF LEROY "SATCHEL" PAIGE (1981). I remember enjoying the latter film, which starred Louis Gossett Jr., when it first aired on television. 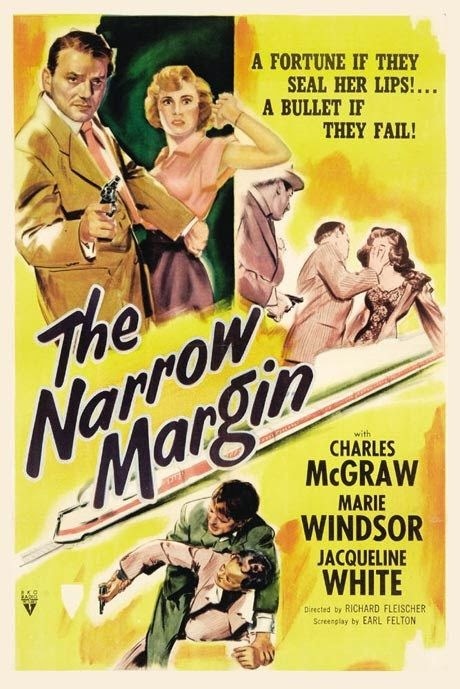 The afternoon concluded with a 35mm screening of a beautiful print of THE NARROW MARGIN, which I first saw on DVD in 2009 and had the good fortune to see at the 2013 TCM Classic Film Festival. I was ready to see THE NARROW MARGIN again just a year after my last viewing, and I've come to realize I could easily see it annually without tiring of it, I like it that much. Starting with the opening title, every shot is beautiful, every line of dialogue memorable ("strictly poison under the gravy"). 71 minutes of pure noir joy. My gratitude to Stanley Rubin for making such moments of movie joy possible, and my sincere condolences to his family. I appreciate that they shared such a wonderful afternoon with his many admirers. Time now to return to the last film on the last evening of this year's Noir City Film Festival, which wrapped up on April 6th, just days ahead of the TCM Classic Film Festival. Consequently this movie is part of quite a backlog of festival films I plan to review! 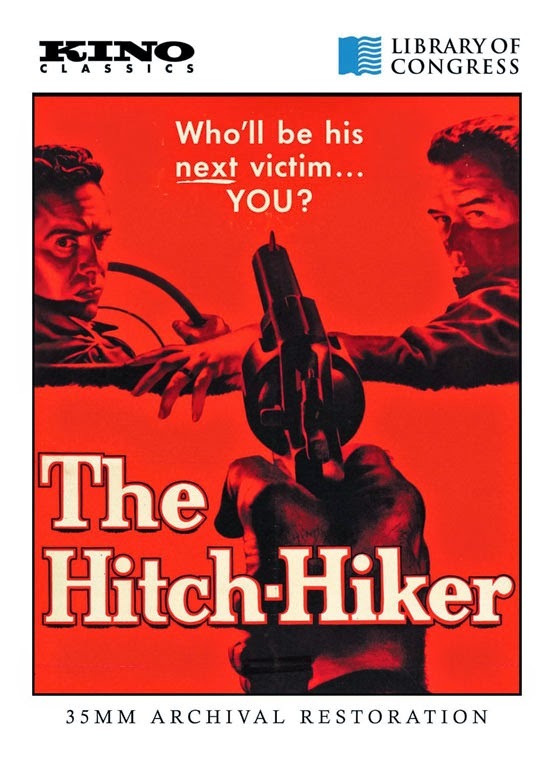 The "serial killer" double bill on the final night of the series started out with Joseph Losey's excellent remake of M (1951) and concluded with THE HITCH-HIKER (1953). THE HITCH-HIKER is a taut 71-minute kidnapping drama loosely inspired by a true story. It was directed by the amazing Ida Lupino, who was also among those who worked on the screenplay. Roy Collins (Edmond O'Brien) and Gilbert Bowen (Frank Lovejoy) are longtime pals off on a fishing trip. 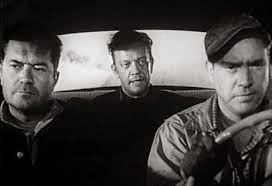 The good-natured guys pick up a man (William Talman) they believe has run out of gas, intending to help out by dropping him off in the next town, but very unfortunately it turns out he's Emmett Myers, a psychotic killer who has already killed at least three other people that week. It won't be long before Roy and Gil have outlived their usefulness and he's ready to shoot them, too. THE HITCH-HIKER is extremely well done, as one would expect given the talent in front of and behind the camera, although I must admit it's also more than a little exhausting! 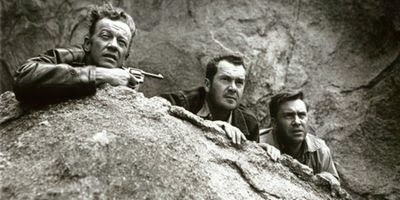 The tension is occasionally broken by a switch to Captain Alvarado (Jose Torvay) and others on the hunt for the killer and the missing men, but honestly I would have liked even more cuts away, or perhaps Reed Hadley in his frequent omniscient narrator role to reassure me all would be well. As someone who enjoys both O'Brien and Lovejoy, I was again impressed by their work as two men who can't quite believe the hand they've been dealt by fate. Their very low-key "regular Joe" normality makes the film that much more relatable and scarier. They struggle through their fear in order to support one another, at times bravely snapping back at their tormentor and struggling to survive, while at other times ready to give up and be done with it. The movie also makes believable that these two ordinary guys, on the wrong end of a gun, wouldn't at some point try to rush Myers and overpower him. In recent years I've come to have considerable appreciation for William Talman, who was equally adept at playing crooks (ARMORED CAR ROBBERY) or heroes (ONE MINUTE TO ZERO). His portrayal of the sadistic Myers is absolutely chilling, not least the creepy detail that one of his eyes will never completely shut, so his victims can't tell whether or not he's asleep. 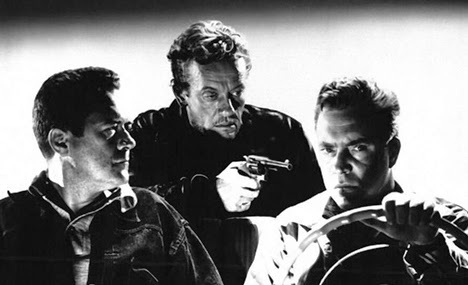 Given how very unusual Lupino was as a female director in 1950s Hollywood, it's particularly interesting that she headed up such a tough, gritty project, directing what is essentially a three-man character drama, with the other actors in the film in much smaller roles. Needless to say, she does a fine job. So fine that I'm not sure if I'll watch this one again! The movie packs quite a punch, and I particularly had trouble forgetting Myers' threat near the end to shoot the men and dump their bodies down a well. Lupino builds the suspense to an almost unbearable level, but the payoff is that the first sight of the barrel of a police gun aimed at the unaware Myers comes as a huge cathartic relief. The film got me to wondering how stressful it is to make a movie like this. Somehow I can't imagine doing something this intense is much fun, but perhaps the cast members find it a welcome challenge. THE HITCH-HIKER was shot in black and white by Nicholas Musuraca (OUT OF THE PAST). THE HITCH-HIKER is available on a remastered DVD from Kino. It can be rented from Netflix or ClassicFlix. It can be rented for streaming from Amazon Instant Video. 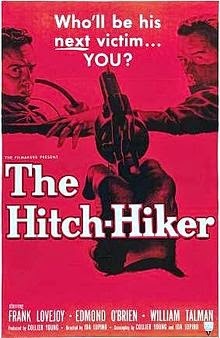 Streaming THE HITCH-HIKER is free for Amazon Prime members. Kim Morgan pays tribute to Ida Lupino and her work on this film at Sunset Gun. Once again this year's Noir City Festival was a wonderful event! In the span of 17 days I saw 8 films which were brand-new to me and 5 which were repeat viewings. The biggest impressions were probably made by TOO LATE FOR TEARS (1949), HARDLY A CRIMINAL (1949), and ALIAS NICK BEAL (1949), but I enjoyed every single film I saw and am already eagerly anticipating the 17th annual festival in 2015. Thanks to the Film Noir Foundation and the American Cinematheque for putting on such an outstanding series! Tonight I watched the 13th and final RKO FALCON film, THE FALCON'S ADVENTURE (1946), and I have to say I was quite sorry to see this congenial movie series come to an end. At least I still have the Saint and Boston Blackie! This time around Tom Lawrence, aka the Falcon (Tom Conway), and righthand man Goldie (Edward Brophy) come to the rescue of Louisa Braganza. Louisa falls prey to kidnappers who want her uncle's formula for creating industrial diamonds. 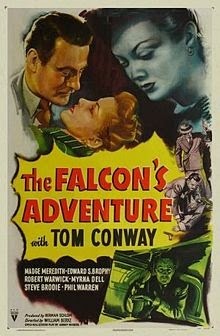 THE FALCON'S ADVENTURE is one of the less scintillating entries in the series, but it's still a pleasant 61 minutes. The good cast includes a small role as a cop for Jason Robards Sr., who has such a distinctive voice; Ian Wolfe as an elderly man caught up in the intrigue (Wolfe was only about 50 but began playing old men at a young age! ); and Myrna Dell and Steve Brodie among the bad guys. The other night I said I felt like this was "the year of Steve Brodie" because he is turning up so frequently in my viewing. Here he was again tonight! A glance at his nearly 170 screen credits reveals I've seen a majority of his films of the '40s, in particular, and most of his '40s titles which I've not yet seen are in my collection. 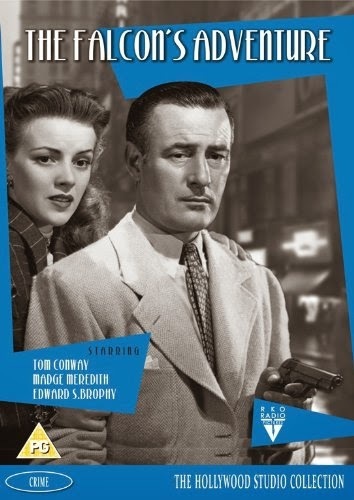 Although THE FALCON'S ADVENTURE concluded RKO's long-running series starring George Sanders or his brother Tom Conway, technically there were three additional Falcon films. John Calvert played a new character named Michael Waring in movies released by an independent production company in 1948 and 1949. There was also a 1954-56 TV series with the Mike Waring character which starred Charles McGraw, which is rather fascinating as the rough-hewn McGraw is so different from the urbane Sanders and Conway. THE FALCON'S ADVENTURE runs 61 minutes. It was directed by William Berke. 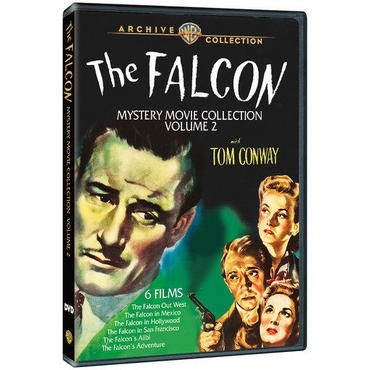 This film is available on DVD in a very nice print in the Warner Archive's The Falcon Mystery Movie Collection, Vol. 2. I highly recommend both volumes as solid, well-crafted entertainment. I find that one of these short mysteries, which typically run about an hour, can be just the ticket for late-evening viewing when there's not time to dig into a longer or weightier film, and they often have very interesting casts. The leading ladies of the Falcon series include Barbara Hale, Jane Greer, Harriet Hilliard (Nelson), Wendy Barrie, and Jane Randolph (CAT PEOPLE). THE FALCON'S ADVENTURE has also had a release on Region 2 DVD in Europe. Reviews of the earlier films in the series: THE GAY FALCON (1941), A DATE WITH THE FALCON (1942), THE FALCON TAKES OVER (1942), THE FALCON'S BROTHER (1942), THE FALCON STRIKES BACK (1943), THE FALCON IN DANGER (1943), THE FALCON AND THE CO-EDS (1943), THE FALCON OUT WEST (1944), THE FALCON IN MEXICO (1944), THE FALCON IN HOLLYWOOD (1944), THE FALCON IN SAN FRANCISCO (1945), and THE FALCON'S ALIBI (1946). It's time for the April Disney News roundup! 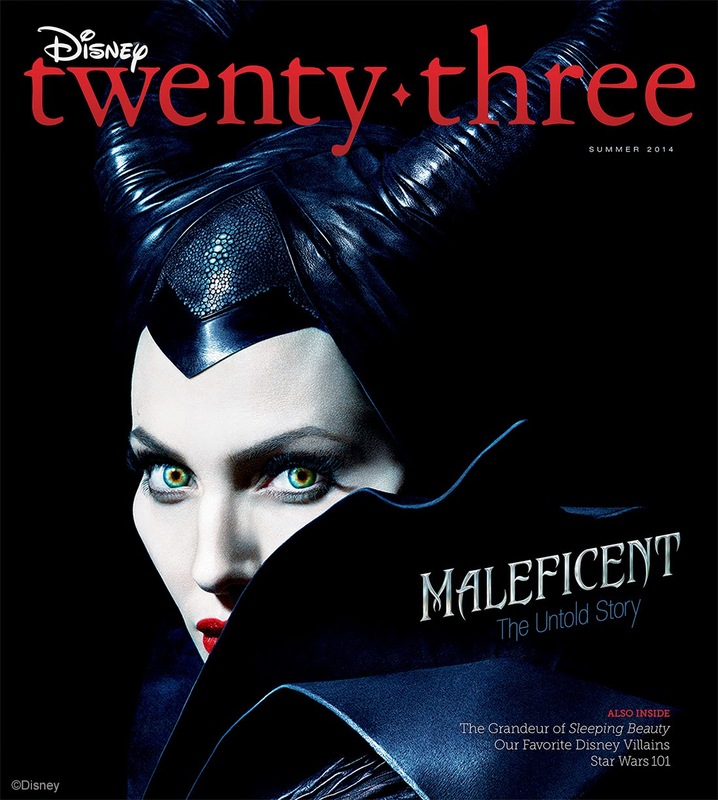 ...Earlier this week D23 released the cover of its upcoming Summer 2014 issue, featuring Angelina Jolie as MALEFICENT (2014). More details on the issue will be released soon. ...The Walt Disney Family Museum in San Francisco hosts the exhibit Magic, Color, Flair: The Art of Mary Blair through September 7, 2014. Photos can be seen at MiceChat, and the San Francisco Chronicle ran an article on Blair and the exhibit. A related book by exhibit curator and animation historian John Canemaker will be released on May 7th, and an updated edition of Canemaker's excellent 2003 book THE ART AND FLAIR OF MARY BLAIR is due out on May 20th. 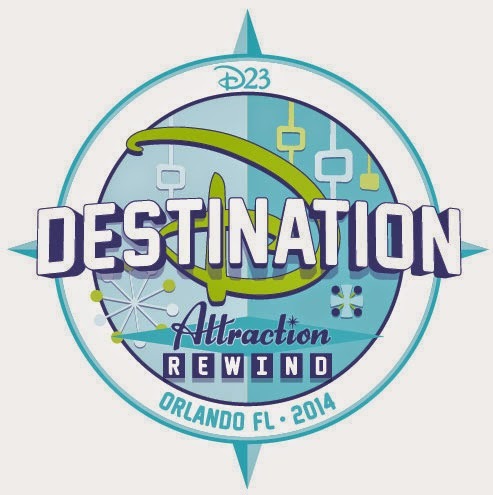 ...As mentioned in February, I was given more than passing thought to attending D23's Destination D: Attraction Rewind in Orlando this summer. The two-day event will feature multiple panel presentations on Disney at the 1964 World's Fair as well as focus on favorite rides of the past such as America Sings and Monsanto's Adventure Through Inner Space. Unfortunately, Disney unexpectedly shifted the date from July to the weekend before Thanksgiving, which makes my attendance much more unlikely. I'm disappointed that Destination D isn't in Anaheim this year and wish Disney would consider hosting a duplicate weekend in California, particularly as so much of the weekend focuses on Disneyland attractions. Destination D weekends are always packed, and I suspect they could fill weekends on both coasts. 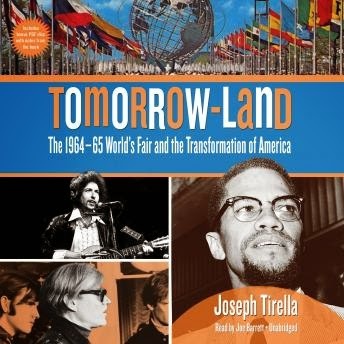 ...A new book on the '64 World's Fair: TOMORROW-LAND: THE 1964-65 WORLD'S FAIR AND THE TRANSFORMATION OF AMERICA by Joseph Tirella. ...I also recommend a deluxe CD set, Walt Disney and the World's Fair, which came out for the fair's 45th anniversary in 2009. ...The D23 Expo returns to Anaheim for three days, August 14-16, 2015. I again plan to attend the entire Expo! ...In late February Disney launched a streaming service, Disney Movies Anywhere. 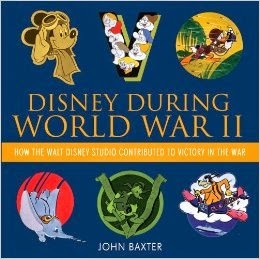 ...I'm excited about the book DISNEY DURING WORLD WAR II by John Baxter, due out October 28th. It's a fascinating topic. One of the interesting older books on this subject is DISNEY DONS DOGTAGS: THE BEST OF DISNEY MILITARY INSIGNIA FROM WORLD WAR II. ...The New York Times had a long but fascinating story by Ron Suskind, "Reaching My Autistic Son Through Disney," excerpted from Suskind's new book, LIFE, ANIMATED: A STORY OF SIDEKICKS, HEROES, AND AUTISM. ...Pixar plans to reissue THE INCREDIBLES (2004) and RATATOUILLE (2007) in 3D. 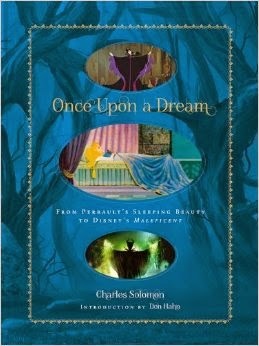 ...Coming June 17th, a book by Disney historian Charles Solomon, timed to tie in with the release of MALEFICENT: ONCE UPON A DREAM: FROM PERRAULT'S SLEEPING BEAUTY TO DISNEY'S MALEFICENT. The cover also features scenes from Disney's animated SLEEPING BEAUTY (1959). Given how much I love the Disney cartoon it's safe to say that the book will be a "must buy" for me. ...Chris Pine is set to star in a '50s Coast Guard drama for Disney, THE FINEST HOURS. It's based on the book THE FINEST HOURS: THE TRUE STORY OF THE U.S. COAST GUARD'S MOST DARING SEA RESCUE by Michael J. Tougias and Casey Sherman. ...A Disney remake of SOMETHING WICKED THIS WAY COMES (1983), based on the book by Walt Disney's friend Ray Bradbury, is in the works. ...Brand-new book: THE IMAGINEERING FIELD GUIDE TO DISNEY CALIFORNIA ADVENTURE. 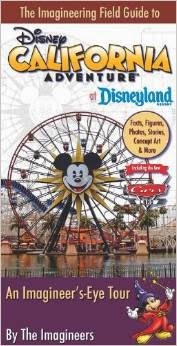 I have five other books in this series, on Disneyland and the four Florida parks, and am delighted that now that California Adventure has been successfully remodeled it will have its own book. ...Oswald the Lucky Rabbit recently debuted at Tokyo DisneySea. Oswald belongs at Oswald's Gas Station on Buena Vista Street in Disney California Adventure, so I'm hoping he shows up there soon. ...Gizmodo has interesting designs for a ski resort Disney discussed building in the Sequoia area in the '60s...and BuzzFeed has some very nice color photos of Disneyland in 1955. ...Disneyland is hosting a series of after-hours parties at California Adventure aimed at renewing annual passholders; the next event, titled "Here Comes Summer!" is aimed at passholders renewing between June 18 and September 6. We attended an after-hours St. Patrick's Day party last month, and I have to say it was one of the rare times Disney has let us down. They weren't prepared for the deluge of annual passholders who arrived to check in shortly before the party started, resulting in an endless line that circled around the Esplanade and entrance to the park well after the party started, plus the holiday offerings seemed to consist mostly of green water fountains in Paradise Bay and entertainment by the Green Army Men. Let's hope the summer party is better organized. By contrast, we had a fantastic time at a Fantasyland party back in 2011. ...Take a look at these fantastic new Mondo Posters created for a number of older Disney films...and there's one for FROZEN (2013) which is absolutely fantastic. ...Disney plans an It's a Small World movie?! ...The Disney Parks Blog takes a look at some of the details in Disneyland's It's a Small World, which debuted at the New York World's Fair half a century ago before moving to Disneyland permanently in 1966. ...Here's MiceChat on rumored plans for Disneyland's 60th anniversary next year. 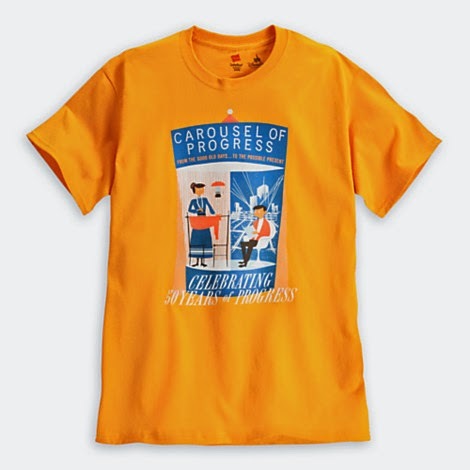 ...Selling online only through Sunday, April 27th: T-shirts celebrating the 50th anniversary of It's a Small World and the Carousel of Progress. Disney has been trying out the t-shirt equivalent of "MOD" DVDs, taking preorders for special t-shirts and then filling them a few weeks later. My husband was very happy with his Disneyland Railroad shirt, as seen in the February roundup. ...Earlier this month the New York Times ran an article on Disney World's Magic Bands. The feedback I'm getting from friends and internet sources is not very good, with issues including standby lines for rides which didn't previously have Fast Passes now being much longer. 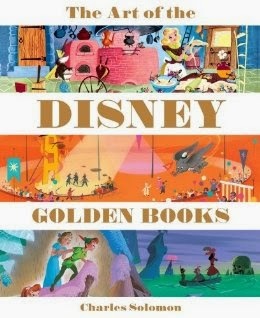 ...I just purchased Charles Solomon's THE ART OF THE DISNEY GOLDEN BOOKS, first mentioned here last September, and am very impressed. 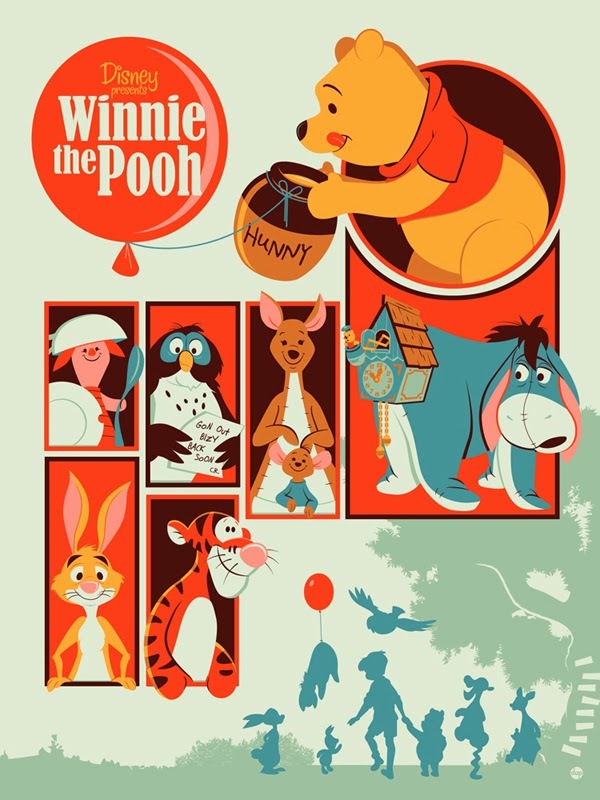 It's filled with beautiful, nostalgic book covers and illustrations; the pages inside the front and back covers, featuring cover art for numerous Disney Little Golden Books, is gorgeous. This is going to be a wonderful read. ...A great idea at Disneyland: the "Almost Tall Enough" card, given to children who aren't yet quite tall enough to safely ride the newly reopened Big Thunder Mountain Railroad. The card can be saved and used as a Fastpass once the child is tall enough to ride. ...I finally rode on Big Thunder last Saturday and can report I was extremely impressed, it was an amazingly smooth ride and the new "explosion" effects are spectacular. 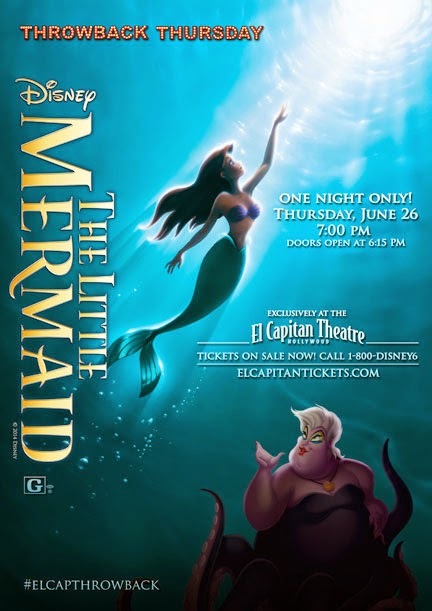 ...Attention Southern Californians: Disney's next "Throwback Thursday" screening at the El Capitan Theatre will be THE LITTLE MERMAID (1989) on June 26th at 7:00 p.m. Throwback Thursdays have lower General Admission prices, with the $10 ticket including free popcorn and soda. It's a great deal, and the screenings are usually filled with enthusiastic Disney fans. ...The El Capitan Theatre is currently showing BEARS (2014), with MILLION DOLLAR ARM (2014) coming May 16th through 26th and MALEFICENT (2014) on May 30th through July 17th. 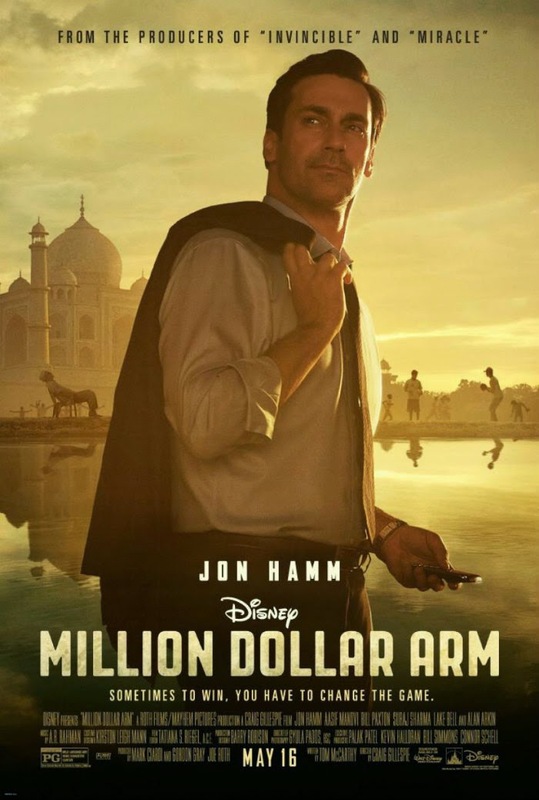 ...I have tickets to a free D23 screening of MILLION DOLLAR ARM at Downtown Disney next week, a couple of weeks ahead of its May 16th release date. Look for my review in a few days! The advance buzz on this film starring John Hamm (MAD MEN) is positive. 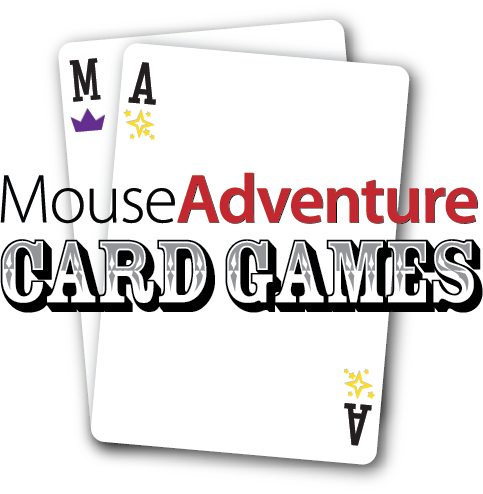 ...Our family team, Skippers in De Nile, will once again be playing in the twice-yearly MouseAdventure game at Disneyland this Sunday, April 27th. This time around the game is titled "Card Games - Deuces Wild." For more recent Disney links, please visit the Disney News posts for January and February. Saturday morning, April 12th, I was in line at the El Capitan Theatre bright and early for a 9:00 a.m. TCM Classic Film Festival screening of THE JUNGLE BOOK (1967). I had contemplated seeing Barbara Stanwyck's STELLA DALLAS (1937) in that time slot, especially as it has a supporting cast which includes Tim Holt and Anne Shirley, but the pull of Disney was too strong! THE JUNGLE BOOK was the third film I ever saw on a big screen as a child, and it was the first film I saw at a drive-in, paired with BLACKBEARD'S GHOST (1968). (In fact, I suspect I could count the films I saw at a drive-in on one hand!) 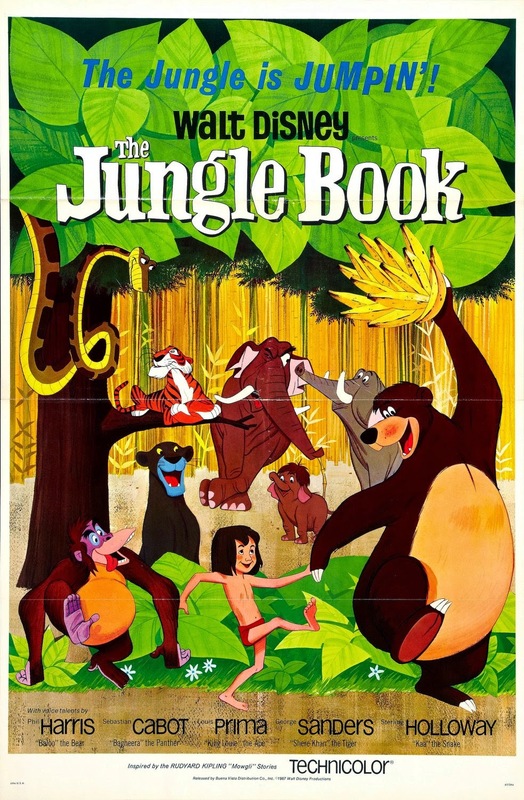 THE JUNGLE BOOK is one of those movies I saw in bits and pieces when my children were younger, but I don't believe I'd sat down to watch it all in a single sitting since that drive-in screening of the late '60s. I jokingly Tweeted at the time that the El Capitan organist serenading us with Disney tunes at the TCM Classic Film Fest was "almost too much awesomeness to handle." It really was a delightful way to start a day in which I would see four excellent films plus the legendary Maureen O'Hara. Still a bit teary from the happy glow of THE JUNGLE BOOK, I went back across the street to the Chinese Multiplex for another great experience, seeing a restored digital print of Frank Capra's MR. 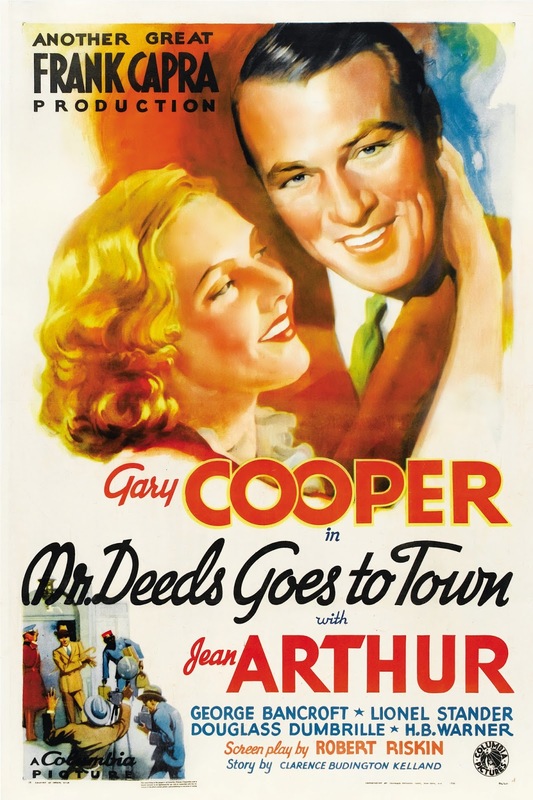 DEEDS GOES TO TOWN (1936). I had seen the film on a big screen years ago, but not as long ago as THE JUNGLE BOOK! You simply can't go wrong with Jean Arthur paired with Gary Cooper. MR. DEEDS was also the first of three sightings that day of everyone's favorite extra, Bess Flowers. There are many shots of her in the courtroom sequence in MR. DEEDS; she was a party guest in WRITTEN ON THE WIND (1956) and a dancer at a restaurant in HER SISTER'S SECRET (1946). The latter is my second Flowers sighting in the last few months which hasn't yet made it to her IMDb entry, where at present she has 843 credits listed. After MR. DEEDS my friend Lindsay and I raced back across the street to join the huge line at the El Capitan, where Maureen O'Hara was introducing HOW GREEN WAS MY VALLEY (1941). ...and they had a short but spirited chat. Miss O'Hara may be a bit frail now but she is as fiery as ever. When Mr. Osborne asked her a question about working with John Ford, she quipped "I thought we were here to talk about me!" In all seriousness, though, it meant a great deal to be part of the crowd expressing our love and admiration for the truly legendary actress, and she appeared to be deeply moved by the prolonged standing ovation. I'm so grateful I had the opportunity to be there. O'Hara told the adoring crowd "Don't be fooled into thinking I do magic things." I think the audience would disagree. After the interview I did something I've never before done at the festival and slipped out of the theater without seeing the movie, as I'd just seen -- and loved -- HOW GREEN WAS MY VALLEY (1941) last New Year's Eve. 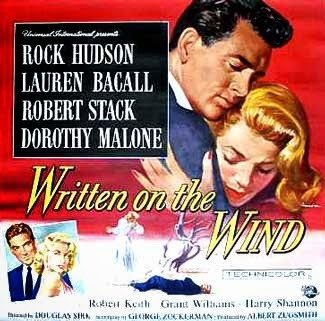 I was also concerned that if I watched HOW GREEN WAS MY VALLEY I might not be able to get in line early enough to see the next film on my list, WRITTEN ON THE WIND, which I hadn't seen for roughly a decade. I'd initially thought of going to see Kim Novak introduce BELL BOOK AND CANDLE (1958) at the Egyptian Theatre in that time slot, but since I was fortunate enough to see her in person at the festival's opening night, I decided instead on WRITTEN ON THE WIND. 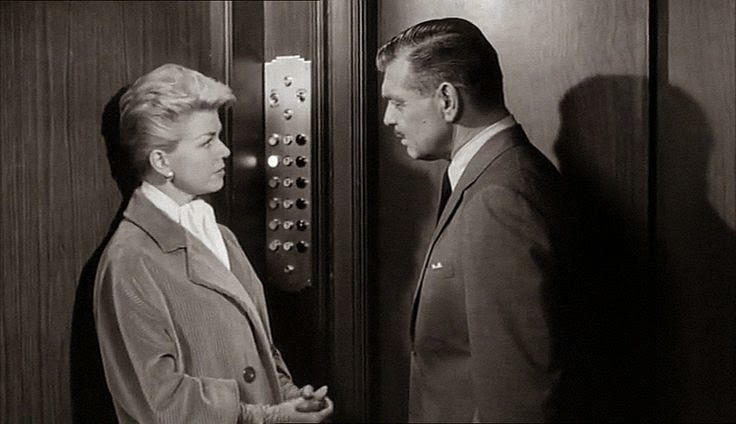 I anticipated this Douglas Sirk film would be a visual feast on a big screen, but in all honesty this 35mm print was probably the most disappointing of the festival. It didn't have any skips or major flaws, but the level of dark graininess was not what I would have expected. Despite the fact that the movie wasn't as visually dazzling as it otherwise might have been, I love this film in all its glorious excess, starting with its fantastic title sequence, and I still enjoyed it immensely. 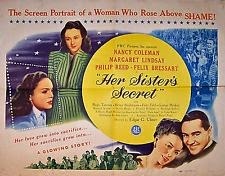 I ended my moviegoing day with one of my favorite screenings among the many great movies seen at the festival, Edgar Ulmer's little-known PRC film HER SISTER'S SECRET (1946). The movie was engagingly introduced by the director's well-informed daughter, Arianne Ulmer Cipes, and Jan-Christopher Horak of the UCLA Film & Television Archive. I'll be sharing an overview of the festival's final day in the near future, and I'll also be sharing more about the films referenced above in individual posts. In the meantime, be sure to also read this great festival overview recently posted by Aurora at Once Upon a Screen. 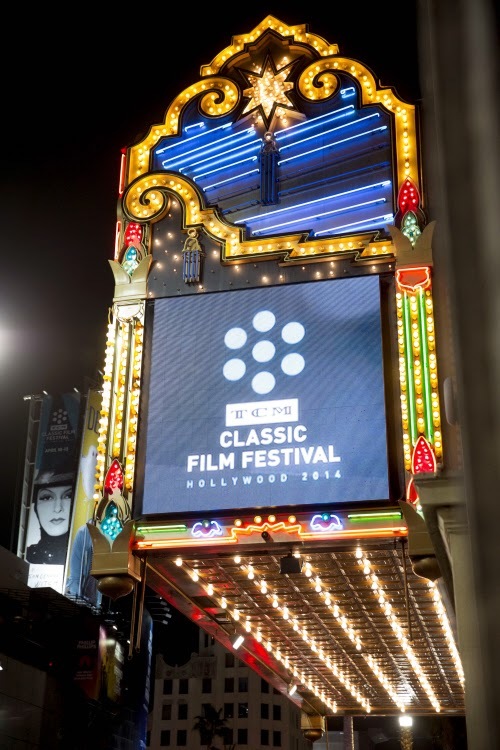 For more links to my coverage of the festival, please visit The 2014 TCM Classic Film Festival in Review.